It took 163 games but the Milwaukee Brewers have been crowned the 2018 NL Central Division Champions! This is their first division title since 2011 and they now have home field advantage through the NL playoffs. To commemorate the Brewers' season, Big Time Bats has released this Milwaukee Brewers Central Division Champions Roster Bat. 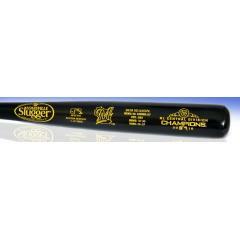 This officially licensed Louisville Slugger bat comes engraved with the Brewers' final record, the NL Central Champions logo, and has the members of the Brewers' team engraved on the bat. From Yelich, to Cain, to Braun, all of the Brewers stars are recognized. This is a great commemorative to honor the great Brewers’ team. Order your bat before they are sold out! This black and gold Louisville Slugger bat measures 34 inches and weighs approximately 31 ounces, which are the same measurements as most MLB game model bats. Louisville Slugger is the official bat of Major League Baseball. The bat is officially licensed by both MLB and the MLBPA. This is an exclusive bat to bigtimebats.com; you will not find it anywhere else!